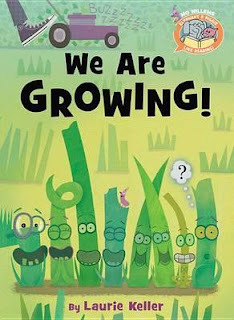 Kids' Book Review: Review: We Are Growing! This book is about as interesting as watching grass grow...but that is VERY interesting when the characters are blades of grass and they are growing in all sorts of crazy directions! Part of the new Elephant and Piggie Like to Read series (a spin off of Mo Willems' Elephant and Piggie series) the book is introduced by Mo Willems as one of Elephant and Piggie's favourite books to read, and brings us a story with the same enthusiasm, sense of fun and wonderful friendships that we've come to expect from the Elephant and Piggie series. We watch as the blades of grass grow and discover that they each have a special feature, one is the tallest, another the curliest and another still is the pointiest. One blade of grass however worries that he is not the any-thing-est, but while his friends try to help him discover who he is, they all get an unexpected buzz cut from their friendly neighbourhood lawn mower. Don't worry though, they will always grow back! We are Growing is a delightful early reader but can easily be used as a picture book for 2 - 5 year olds as well. There is minimal text as the story is told through conversations between the characters, with lots of wonderful action words scattered in between. Each of the characters' speech bubbles are colour coded making it easy to see who is saying what, which will be of great assistance to new readers as they learn how to navigate a written conversation. The use of varying fonts, capital letters and italics clearly shows beginner readers where and how to place emphasis. The wonderful sense of humour makes it not only a great story for parents to read aloud to younger kids, but may also be just the thing to draw in those reluctant readers. I am super keen to discover what other titles are to come in this new series!